The name conjures up images of some distinguished gent being proper about all things important. Well that’s what we wanted when we named this muttly lost black dog that turned up in the woods on the edge of our property. Skinny, and without any dignity whatsoever while eating, we had hoped that such a prestigious name would surely lead to his adoption at the local animal shelter. No such luck. 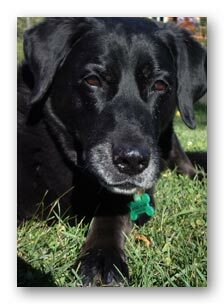 It seems Animal shelters across the country are full to the top when it comes to black lab mixed breeds. And the unfortunate reality of pet overpopulation is grim indeed. Euthanasia is the leading cause of death in companion animals, and most euthanasia occurs at animal shelters. Chadwick had been a member of the family for the past 12 years. He had been living his dream life here at home, and had gone so far as to have the place named after him…Lucky dog. We are very sorry that Chadwick passed away due to natural causes because of his age, but Chadwick farm lives on as does our memory of a very fine friend. We have recently adopted a fine young black Lab to tag around the garden with us, he has big shoes to fill. The size of his feet indicate that he may one day grow into the job.